Zhao Xiao is a prominent Chinese economist who has gained attention for arguing that China’s economy would benefit from the spread of Christianity. Zhao Xiao is a prominent Chinese economist who has gained attention for arguing that China’s economy would benefit from the spread of Christianity. He wrote an essay in the Chinese edition of Esquire entitled “God Is My Chairman of the Board” which was based on a paper called “Market Economies With Churches and Market Economies Without Churches.” He later converted to Christianity. Here, he talks with FRONTLINE/World reporter Evan Osnos about what Christianity could bring to China, the relationship between morality and a market economy, and his own conversion to Christianity. The interview was edited for clarity. Evan Osnos: When did you begin studying the U.S. markets to write the article about Christianity’s influence on them? 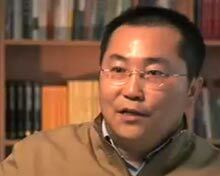 ZHAO XIAO: I wrote it in 2002. During that time, I went to America to observe and study what kind of differences there are between the market economies of the United States and China. The one fundamental difference I discovered is that, in America, there are churches everywhere. On the other hand, in China -- and I’ll crack a joke -- there are bathhouses everywhere. So I wrote an article entitled “Market Economies W ith Churches and Market Economies W ithout Churches.” This is the first time in the 20 years of China’s reform and opening up that anyone in the field of economics undertook a comparison of different market economies from the perspective of morality and a moral market. What did you learn in your research? I discovered that there is a foundation of morality behind the American market economy. In China, on the other hand, we have concentrated a lot on economic reforms but have not paid much attention to that moral foundation. We still need a transition in the area of morality. Only then can this kind of organic transformation be a thorough reform. How has the article been received? After this article was published, it received a lot of attention. Even today, it still has a significant influence. During the [last meeting] of the Fourteenth Central Committee of the Chinese Communist Party, a report was presented entitled “The Decision to Deepen Economic Reform.” It was a policy design for economic institutional reform, but it also started to incorporate content related to morality. It talks about establishing a system in China based upon trust. It spoke of three requirements, or needs : for morality to serve as a support, for property rights to serve as a foundation, and for the law to serve as a safeguard. Well, I’m very happy to see this kind of thinking, which is emphasizing the moral foundations of market economic transformation and has evidently captured the attention of policy makers. What is the relationship between morality and a market economy? A good business ethic or business morality can provide for a type of motivation that transcends profit seeking. Why do people want to do business? The main goal would be to earn money. The purpose of a company is to maximize profits. But this can cause companies to look for quick results and nearsighted benefits. It can cause companies to disregard the means and earn money at the expense of destroying the environment, society and the livelihood of others, or endangering the entire competitive environment of the trade. We know that America is a country founded by Puritans. And Puritans, their dream of coming to America was the need to establish a city on a hill, to let the entire world see the glory of Jesus Christ, whom they believed in. So their purpose for doing business was for the glory of God. If my motivation for doing business is the glory of God, there is a motivation that transcends profits. I cannot go and use evil methods. If I used some evil methods to enlarge the company, to earn money, then this is not bringing glory to God. Therefore, this is to say that it [ bringing glory to God] can provide a transcendent motivation for business. And this kind of transcendental motivation not only benefits an entrepreneur by making his business conduct proper but it can also benefit the entrepreneur’s continued innovation. Why do you think bringing morality to a market economy is so important? For many people in this market environment, the reason why they do evil things is because the overall market environment is not very good. Under these not-so-good market conditions, they utilize this method of doing evil things to protect themselves. Or when they predict that other people might do evil things to them, they do it first. We call this the “prisoner’s dilemm a,” in which people do bad things not because they are bad people but because they worry that others would ruin them, so they ruin others first. This kind of behavior we find very common in the marketplace. Another example is externalities, which is to say, "I have this company, and the money it generates is mine, but the cost is possibly carried by the entire society." For example, environmental pollution belongs to all of society. Under this condition, many people are willing to further expand their businesses, but they do not care about the costs they pass on to society. When we encounter this kind of situation, economists call it “externality.” This is an area where markets are imperfect. If this market consists of more people with morality, then we can discover that it does not matter whether we talk of externalities or of the prisoner’s dilemma -- these phenomena would decrease. This is especially so if they do business with one another within a group of moral individuals . Then, they can form mutual trust among them. They will have a common position and a common relationship based upon trust. Are you optimistic about how the Communist Party will react to increased Christianity in China? We know that China’s constitution allows freedom of religion, so it should be said that the constitution has enough space for all kinds of beliefs, including Christianity. We also know that the Chinese Communist Party makes a point to seek truth from the facts and advance with the times. Within Marxist theory, the Communist Party is supposed to be the vanguard of the proletariat. But in China we really lack a mass of proletarians because, in those early years, the country did not undergo a phase of industrialization. And today, they are not only non-p roletarians ; they are the propertied classes. So it is no longer a political party that is filled with revolutionary characteristics but rather one that has transformed into a ruling political party with widespread representation, advanced culture and advanced forces of production. This transformation comes from permitting these rich people, these propertied classes, and even, we can say, the bourgeoisie to join the party. We see that the Communist parties of the Soviet Union and all of Eastern Europe have collapsed, and their countries have collapsed with them. But the Chinese Communist Party survives precisely because it continues to change. That is why it is a great political party. And I believe that, on the matter of whether or not to permit those with religious beliefs to enter the Communist Party, I believe there will be a historical change in the future. How do others feel about your theories? I talk about how China’s transformation must have a moral foundation. This, it has to be said, is a widespread consensus. At the same time, I proposed that the formation of this kind of morality could be in the spirit of a mix between the traditional culture of China and Christian beliefs, a process of blending. I had thought that many people would oppose me, including recently at discussion at a club in Qinghua University attended by many Chinese elites. But what made me feel strange is that they all supported me. There are aspects of my argument that they disagree with. For instance, my using America as an example, they don’t agree. They say, "L ook, there are some areas where America did not do a good job." They did not agree with my evidence, but they agreed with my overall viewpoint. What would a blend of Christian beliefs and Chinese culture bring to China? I believe that it will bring two things, and these two things will be very important for the future social structure of China. The first thing it will bring is a spirit of contracts. We know that, whether it is a market economy or a constitutional system, behind them all is a civilization based upon rules. So what we need is a group of people who observe rules. Only then can this system work with highest efficiency. And this spirit of contracts, it comes from belief in Christianity, because we know that in the Bible, for instance, there are the Ten Commandments. These are contracts God signed with humans. The second thing it will bring is the spirit of universal love. There is no culture that can match Christianity’s degree of prizing love, because what it emphasizes is a form of unconditional love, a love for everyone, including those who are not lovable, including those who have hurt you or oppressed you. You have to love them, regardless of whether they are good or bad to you, regardless of whoever they are, you must love them. So this kind of love is a sign of the openness of modern society and modern civilization. It is commonly said that the traditional love in China is called a “hierarchical love,” a love with ranks, with differences. In recent history, there was a great man in China, and even he said this: "I f others do not wrong me, then I do not wrong them. If others wrong me, I will necessarily wrong others.” Commonly, Chinese people believe this, especially in the past few decades; Chinese people commonly use the phrase “there is no love without reason and no hate without reason.” Well, this kind of culture and attitude has caused us to be unable to love others. But if Chinese society wants to have more openness, more harmony, then it needs the spirit of universal love. How has your research into Christianity in the United States changed you as a person? In 2002, when I wrote the article “Market Economies W ith Churches and Market Economies W ithout Churches,” I was not a Christian. I was only following my observations as a scholar and made some observations coolly and rationally. But since then, I started to observe American churches, to go inside churches and observe. Inside these churches, I saw some very touching scenes -- they were all very friendly; they were all so happy. Especially when I saw couples of 70 or 80 years of age who were still like young people just falling in love, this really moved me. I saw the friendship and goodwill among people -- that joy that comes from the depths of the heart -- and the mutual love. This really moved me. From this point, I started to study the Bible. But my initial motivation for studying the Bible is not really pure. My purpose for studying the Bible was not to prove that there was a God. I wanted to look for proof against the existence of God. The reasons are simple. First of all, I believed that I’m not really a good person. I felt that I had a lot of bad thoughts and did a lot of bad things. So if there was a God, whatever bad thoughts I had, he would know; whatever bad things I did, he would know. To me, this is too insecure, so I would rather not have a God. So this was how I studied the Bible: I wanted to prove that it was a good book but that there was no truth to it. But after reading it for over three months, I admitted defeat. I discovered that this kind of book China does not have. China does have morality books. For instance, the Analects of Confucius teaches people morality. China also has very philosophical works, for example, Laozi. China also has many intelligent writings, for instance, the Buddhist texts. But China does not have a book like the Bible. The Bible is a book that claims inspiration from the will of God. It talks about the history of the relationship between God and human beings, and this kind of book does not exist in China.